The massive success of the ‘Despicable Me’ films have created a monster. Monsters, actually. Well, cute, yellow, strange little monsters that countless children (and some adults) all over the world have fallen in love with. 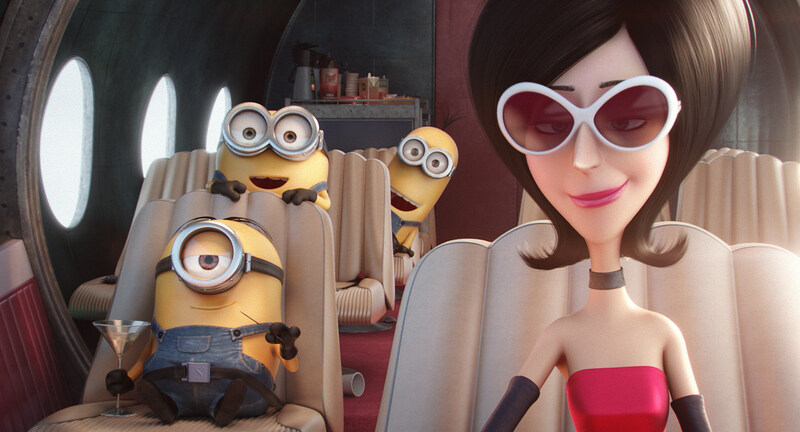 Yeah, ‘Minions’ is going to be huge and it’s all going to be thanks to those little guys. However, the presence of a major star like Sandra Bullock can’t hurt and Universal has released the first images of her supervillain character, Scarlet Overkill. The photos premiered over on USA Today, who also revealed details about the film’s plot and how Scarlet Overkill fits into all of it. Set decades before the Minions meet Steve Carell’s Gru, this is an origin story that reveals the history of these little guys, including their ties to historic figures like Genghis Khan and Napoleon. The bulk of the film is set in the 1960s, with the Minions emerging from years of isolation to serve Scarlet, a charming and deadly supervillain with a high tech arsenal and her own castle. In a bit of era-appropriate casting, ‘Mad Men’ star Jon Hamm will play her husband, Herb Overkill. This is a side to Sandra Bullock we haven't seen before. She is really enjoying playing with this villainy. But underneath there's a character you cannot help but fall in love with. ‘Minions’ opens in theaters on July 10.